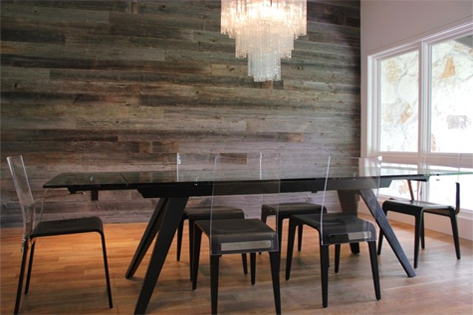 As the look of reclaimed wood has grown in popularity over the years, many manufacturers have started designing and selling faux reclaimed wood. But when you get close to it or touch it, you'll instantly know it's fake. 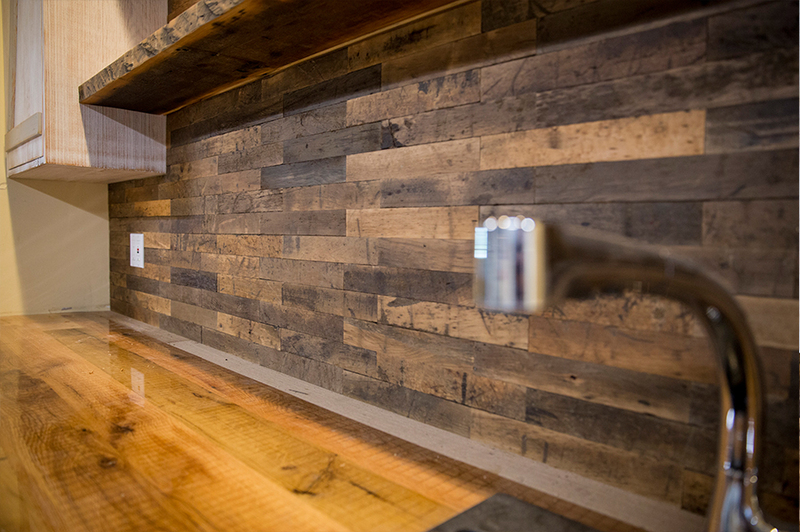 Our reclaimed Thinwood offers a truly exquisite, one of a kind look. All our Thinwood is finished and sealed with a matte finish. Outside cuts will have a more rustic look, but will still be sanded smooth, sealed and finished. Middle cuts will have more of a natural oak coloring, which will vary based on the species of lumber. Our Thinwood is distinguished, yet very competitively priced. It can be shipped boxed and ready for easy installation. Call us at 872-444-5440 or email us for a custom quote. Our thin cut Thinwood was originally the floor of Chicago’s famous Ice Fire building, previously the Harris Marcus Group high end furniture business. During the winter of 2015 a massive warehouse in Chicago’s Bridgeport neighborhood caught fire. It was so cold outside that as water was sprayed onto the building it froze almost immediately leaving behind a beautiful ice-encrusted structure. 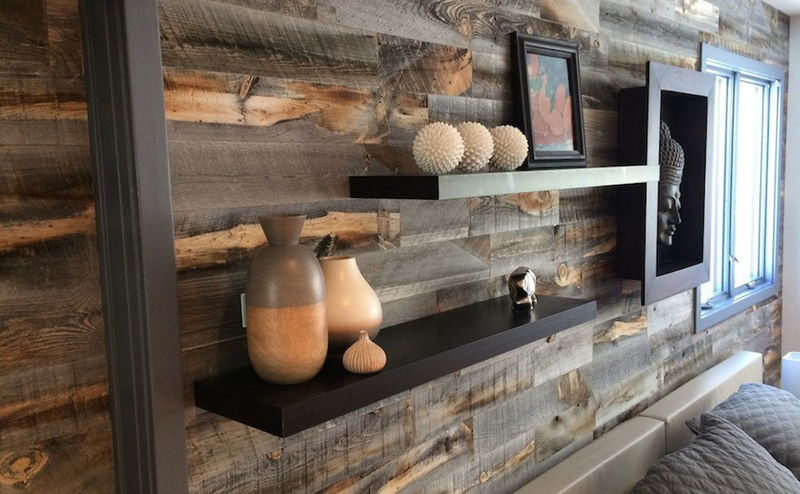 The Thinwood tiles are made to interlock for a more random look when completed. Each tile can be applied by using liquid nails. It may be necessary to cut some tiles down to size to fit your specific room and this can be done with a circular saw, jigsaw, or multi-master tool along with many other basic woodworking saws. The tiles are made to interlock for a more random look when completed. Each tile can be applied by using liquid nails. It may be necessary to cut some tiles down to size to fit your specific room and this can be done with a circular saw, jigsaw, or multi-master tool along with many other basic woodworking saws. Our Wide Thinwood comes from a beautiful thoroughbred farm in Louisville, Kentucky. Wide Thinwood comes with three tape strips already attached to the back of the plank. Simply peel off the paper backing, apply to the wall and you are finished! For an extra secure hold, you can go over the wall with a heavy pressure roller, but this step is optional. 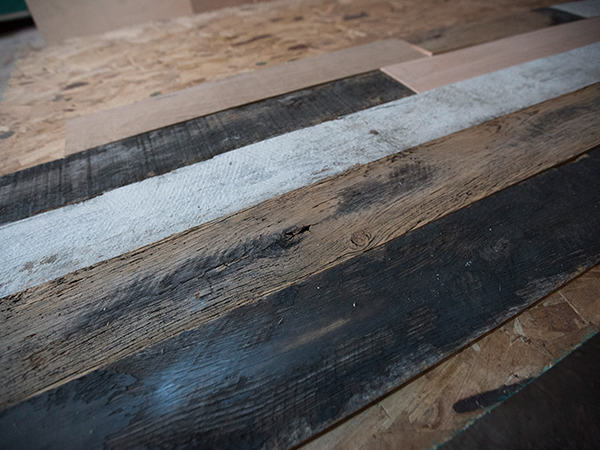 Thicker thinwood comes with three tape strips already attached to the back of the plank. Simply peel off the paper backing, apply to the wall and you are finished! For an extra secure hold you can go over the wall with a heavy pressure roller but this step is optional.